We landed in Cape Town when it was dark, but we could already tell that we were going to be experiencing a much different environment than we had been for the past 4 months. For starters, it was downright cold! After living in Nambia’s dry desert climate, Cape Town’s wet, windy ocean breeze chilled us straight to the bones, and continued to do that for the entire week. I wore, on average, two sweaters and a raincoat everywhere I went… definitely looking as unfashionable as possible in a very cosmopolitan and style-conscious city! Another difference was the sheer number of people, cars, and things surrounding us. Cape Town and the surrounding area has a population of 3.5 million, while the entire country of Namibia hovers at about 2 million. 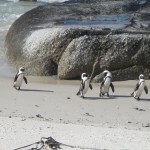 A few highlights of the week included: visiting Robben Island, which is where political prisoners such as Nelson Mandela were housed during apartheid, a trip to Cape Point to see the farthest most south-west tip of the African continent and where the Atlantic and Indian oceans converge, wine-tasting in the fertile Cape winelands, and a brief visit to a penguin colony. Another fascinating aspect of the week was learning about the “Cape Coloured” identity. When the area was just a colony, the Dutch East India company imported slave labor from the West and East coasts of Africa, as well as Madagascar, India, Sri Lanka, Malaysia and other South East Asian countries. After generations of intermarriage and intercultural blending, the result is the “coloured population.” During apartheid, they were given slightly more preferential treatment than the black population, but were second class citizens to whites. In the 1970s, the apartheid government razed the neighborhood of “District 6,” which was home to working class coloured people, because it was located in the desirable real estate of the city bowl. They moved the displaced population to an area called Manenberg, which was little more than a swamp land on the other side of Table Mountain. The effects of this move caused strain on families. Parents had a longer commute into the city for work and could not keep as close an eye on their children, and children had no safe places to hang out and play and began creating gangs and turning to drugs. We visited an organization that is working to reverse some of the problems facing the community by improving youth employment. While this provides hope for the future, the fact remains that people are still living in squalid conditions and unsafe neighborhoods, and that the poorest demographics are still largely separated by race, despite the end of legal sanctions enforcing racial segregation. 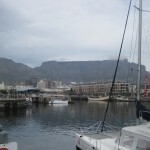 Overall, Cape Town was an interesting change from our lifestyle in Namibia. Lush parks, a beautiful harbor, fancy restaurants, and an abundance of white people, made us feel like we were perhaps in Montreal or Vancouver, BC. It was also a strange time of feeling as if we were in limbo. We had already had an emotional goodbye to Namibia, and we were carting around all of our possessions and living out of our suitcases. It definitely felt like a time of transition. On May 5th, we began our journey back to the states and after 38 HOURS of travel, I was back on campus at UPS. It’s good to be back! 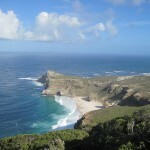 Cape Point, the southernmost tip of Africa! 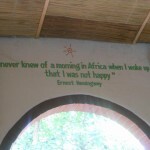 This entry was posted in Abigail Struxness '13, Namibia. Bookmark the permalink.